There’s a good chance the Pope and his posse could pull up behind me in the Popemobile at the ATM and I would still think they were plotting to mug me or judge me for taking too long to complete my transaction. In my defense, I had never even used an ATM before a couple of years ago. I have no idea why that was, but I have since remedied the situation and can say I’ve probably used one in an excess of two dozens times since that first jaunt. However, like most mundane activities, I can find something to complicate the situation. A normal person would simply drive up to the machine, insert their card, enter in their PIN, complete their transaction, grab a receipt and move on with their life. In case you are new here, I’m not entirely normal. You see how exhausting this is? No wonder I held off so long. This entry was posted in Uncategorized and tagged ATM, driving, weirdo. Bookmark the permalink. You’re one of THOSE people ;-p Don’t worry. Practice makes perfect. 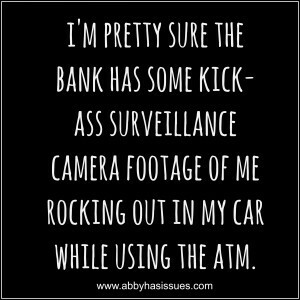 I remember once (like 12 years ago) being with my friend the first time she pulled up to a drive-up ATM. She is an incredibly short person and had to climb up on the handle of her car door to reach the slot to insert her card. In the effort to maintain her balance and aim the thin card into the tiny slot she actually began rolling her car window up onto herself. I guess I could have offered some assistance but I was laughing far too hysterically to function. lol! Can never be too cautious when it comes to the Pope, his posse, and those muggers. It’s a wonder you made it out of there alive! I’m from the UK and we don’t have ‘drive-thru’ ATM’s. I feel I’m missing out. But I would so be one like you. Wow! I’m just amazed you have drive through ATMs. Don’t worry about it. I work in retail banking and have seen just about everything. If this is all you do then consider yourself normal because some of the stuff I’ve seen would blow your mind! I need a Pope mobile, unless of course a prerequisite is having to be an actual Pope. That could be a problem. Here in the UK we still access ATM’s by foot (and we call them cash machines) _ quaint huh? Problem is, this leads to paranoia that the guy behind you is peeping at your bank balance and judging you. It’s a minefield! I’ve been behind you at the ATM way to many times! We use to have a really tall truck and to use the atm in it I had to put it in park, undo my seat belt, roll down the window, then crawl on to the seat and out of the window until I’m balancing just perfectly cause other wise my head would meet the ground. Then of course at this point I remember I dont have my card. Go back, repeat. Finally get the cash from the machine, and had to figure out how to crawl back into the truck. So glad our bank got a walk up atm. Of course after that we traded the truck in for something more normal sized. I hope no one looks at the cameras unless they are robbed. Which in my little town is very rare. 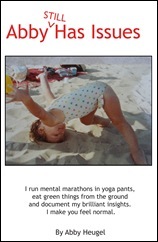 But if they do, I’m sure they got a kick out of my gymnastics routine. I suffer from ATM (Anxiety Taking Money) stress disorder. Swear to god. I never go to the ATM alone because I’m petrified of someone either killing me or mugging me or stealing what little money I have. It’s just one of my many disorders. So happy I found your blog! Ok… this is hilarious and adorable… sometimes u look 4 a jellybean and find a glorious chocolate…. Warning: I’ve just found your blog & may come back regularly! I am also from the UK. We have drive-thru McDonalds & car-washes & all, but no such ATM’s, not yet anyway. I mostly use one where people are regularly mugged, even really big guys, so I guess my day is coming! Love this post, about as much as chilli chocolate!